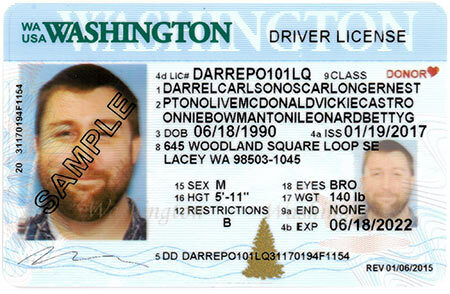 Washington state is starting to issue newly designed driver licenses and ID cards aimed at better protecting residents from identity theft. “This new card system has incredible security features in it that will really decrease the amount of counterfeit cards that exist in the world,” said Pat Kohler, director of the state’s Department of Licensing. Those security features include fine-line printing and ultraviolet ink. The state will roll-out the new cards over the next several months, beginning at its licensing office in Shelton. “And sometime this summer, we would finish the roll-out at all of our 56 offices,” Kohler said. The new licenses and ID cards have a new look, but their functions haven’t changed. The Enhanced Driver Licenses and Enhanced ID Cards (EDLs/EIDs) can be used for all federal identification purposes, including: entering secure federal facilities and, following the January 2018 federal compliance deadline, boarding domestic flights at commercial airports. Standard driver licenses and ID cards are still not valid for these federal purposes. A flyer is available to learn more about these changes and to make sharing this valuable information easy. Want the new driver license before its available at your local licensing office? 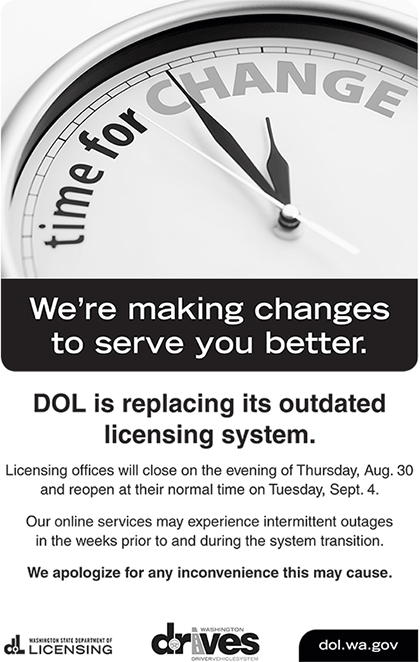 Residents who are eligible to renew their license online will automatically receive the new-look license. In fact, all documents purchased online will now be issued with the state’s new updates. 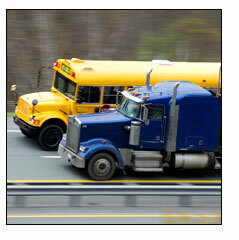 Those documents also include ID cards, enhanced driver licenses, commercial driver licenses and temporary licenses. BUT WHAT ABOUT MY CURRENT DRIVER LICENSE OR ID CARD? You might be wondering, So, what about my current driver license? Kohler said people don’t need to worry because all current licenses will remain valid until they expire, so nobody needs to make a special trip to have their license or ID card replaced. Temporary licenses issued in driver licensing offices will now be printed on a full sheet of paper instead of being a paper copy of the actual license. This is similar to how it’s already done online, and will no longer include a photo. Kohler said removing the photo should help prevent identity theft. Kohler said the process of updating the state’s Central Issuance System also presented an opportunity at its licensing offices. “It was great opportunity for us to look at process improvement, and look at how our customers flowed through the office,” she said. A decision was made to change that flow. Upon arriving at a licensing office, a customer’s first contact will now be with someone who will review their documents. Kohler said this change is aimed at ensuring the customer arrived with the correct documentation needed for obtaining a driver license or ID card. Expect to see this new customer flow, wherein documents are reviewed upon the customer’s arrival, at all licensing offices by this summer. The video below offers additional information about the state’s new driver licenses and ID cards. The Department of Licensing’s website is dol.wa.gov. The Department of Licensing is expanding the number of offices where customers can obtain enhanced driver licenses, enhanced ID cards, commercial driver licenses and commercial instruction permits from 27 locations to 40 locations. The Department of Licensing can’t offer these types of licenses in 16 of it’s smaller locations because they lack the staffing or equipment required to meet federal requirements for issuing documents that require applicants to provide proof of U.S. citizenship or proof of legal presence in the United States. Please note: Once issued, enhanced driver licenses and enhanced ID cards can be renewed at any driver license office, online or by mail. Customers who need to apply for a name change on an enhanced driver license or ID card are required to visit one of the offices above. Also, commercial driver license customers must always renew in person at one of the offices listed above. Beginning February 10, all new driver license applicants will receive a license that’s valid for six years, as the Department of Licensing starts transitioning from a five-year to a six-year driver license. New driver license applicants include individuals applying for their first license and those who are transferring their licenses from another state. The per-year cost for a driver license will remain at $9 per year, but new applicants will pay for the additional year, which changes the fee from $45 to $54, not including the $35 application fee. Adding a new motorcycle endorsement for up to six years will cost $2 per year. 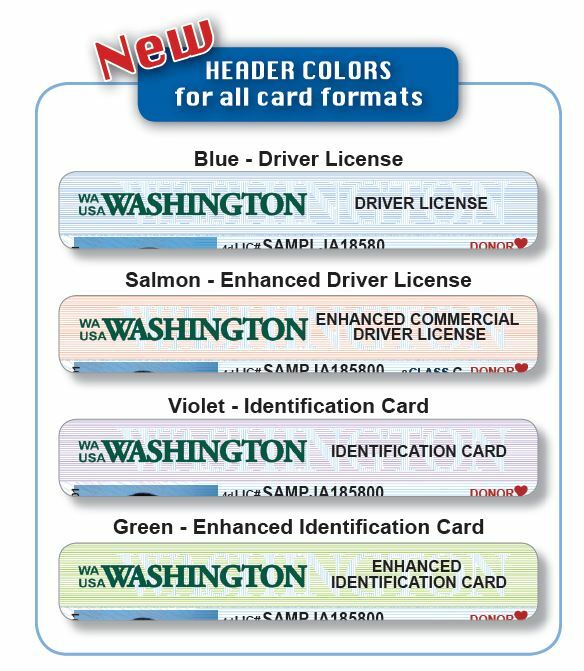 Washingtonians who are obtaining their first Washington state ID cards will also be issued a card valid for six years beginning on February 10, at a cost of $54, or $9 per year. Those renewing a current Washington driver licenses or ID cards will start transitioning to a six-year renewal period later this year. In 2012, the Washington State Legislature authorized extending driver’s license terms from five to six years to improve customer service by reducing customer volumes and wait times in driver license offices. You are currently browsing the archives for the CDL category.